A number of factors contributed to the rapid deterioration of western agricultural lands during the early 1930's. The application of poor farming procedures, misuse of range and extreme lack of moisture were probably foremost in creating these adverse conditions. Recognizing the need to stop further degradation of these valuable lands, Senator Earl Bower, of Washakie County, introduced a bill establishing the Wyoming Soil Conservation Act in February 1941. This Act authorized the establishment of Soil Conservation Districts. These newly formed bodies were given the responsibility of natural resource conservation within their respective districts. On December 31, 1941, the Nowood Soil Conservation District at Ten Sleep became one of the first four Districts in Wyoming. The five Board of Supervisors were Rouse Anderson, A.D. Leithead, Ray L. Brown, E.T. Beckley and L.J. "Smilo" Davis. The District office was established in 1942 and was closed on April 15, 1964 in order to be serviced through the Worland office. Two of the oldest Conservation Districts in the State of Wyoming consolidated to form the Washakie County Conservation District (WCCD) in 1990. This combined the Nowood Conservation District, which was established in 1941 in Ten Sleep, and the Washakie Conservation District, which was established in 1943 in Worland. 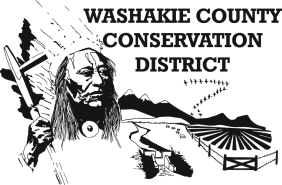 The Washakie County Conservation District holds regular monthly meetings on the third Monday of the month alternating between Worland and Ten Sleep. The first permanent settlement of the Ten Sleep area was around 1880 by cattlemen. The first large herd of cattle were brought into the area by a group of local ranchers in 1886. These cattle were driven over land from Texas to the Upper Nowood country. The flowing winter was severe and 80% of the cattle died because no hay or feed was available. During the 1890's, large numbers of sheep were brought into the area. The resulting feuds were terminated in 1909 in the "Ten Sleep Raid", in which three sheep men and large numbers of sheep were killed. The Washakie County Conservation District comprises 1,477,680 acres, which includes the towns of Worland and Ten Sleep and is located in Washakie County. The western boundary borders on Hot Springs and Park Counties. The northern boundary borders on Big Horn County, and the southern boundary again borders on Hot Springs County. The western part of Washakie County is intensively irrigated farmlands that lie adjacent to the Big Horn River, which winds its way through Worland. Other farmlands are along the Gooseberry and Cottonwood Creeks. The agriculture of the eastern part of Washakie County is based primarily on the production of sheep and cattle. However, there are several breeders of good quality saddle horses in the area. The land surrounding the private irrigated farmlands is public domain and is administered by the Bureau of Land Management. The elevation of the irrigated lands lie 3,900 feet above sea level, along the Big Horn River, north of Worland, to 5,700 feet south of Gooseberry Creek, along the Washakie-Hot Springs County line. Elevations vary from 4,400 feet at Ten Sleep to over 9,500 feet east of Meadowlark Lake, in the Big Horn Mountains. Precipitation ranges from 8 inches in the badlands to over 20 inches in the mountains, with considerable precipitation, in the form of snow, during the non-growing season. The temperatures range from 45 degrees below zero to 105 degrees above zero. Length of the growing season ranges from 90 to 140 days. Considering size, this district has one of the more variable climatic conditions of any in the United States. The district lies in the center of the Big Horn Basin. The Rocky Mountains are to the west, the Prior Mountains to the north, the Big Horn Mountains to the east, and Owl Creek Mountains to the south.